The demands pushed forward in both parts of Kurdistan are almost identical, both demonstrating an attempt at formally installing a confederal municipal system into the region. 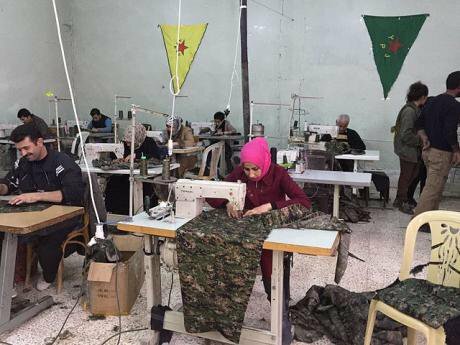 Rojava sewing cooperative in Derik, December 2014. Wikicommons/ Janet Biehl. Some rights reserved.Back in the 1990s Murray Bookchin, exponent of libertarian municipalism, articulated the need to develop a “new politics”, which is “unflinchingly public, electoral on a municipal basis, confederal in its vision and revolutionary in its character”. The creation of a free “commune of communes” – something anarchists, especially Bakunin and Kropotkin, have fought for over the past two centuries – has always been envisioned as an ultimate manifestation of anarcho-communism, hence of a “new politics” based on libertarian municipalism. Today, more than two decades later and in a completely different geography, the Kurds in Rojava/Northern Syria and Bakûr/Southeastern Turkey have become the new avant-gardes of the “commune of communes”. In the fifth year of the Rojavan resistance, in the midst of the Syrian war, the Rojava-Northern Syria Democratic Federation was declared on March 17. In a two-day meeting, held in the Rimelan town of Girkê Legê/Al-Muabbada, 31 parties and 200 delegates came together in a constituent assembly, representing the three self-administered Rojavan cantons Kobanê, Afrîn and Cîzîre, as well as some of the Arab, Assyrian, Syriac, Armenian, Turkmen and Chechen peoples of the regions of Girê Spî/Tal Abyad, Shaddadi, Aleppo and Shehba. The declaration expressed the Rojavan and Northern Syrian people’s will to not engage in the establishment of national independence in the classic sense, but to defend a federative system as part of conflict resolution in the wider Middle East. Grassroots democracy, women’s liberation and a full representation of all societal groups organized in a council system were made the constitutive principles of the social contract. Kurds in Bakûr/Southeastern Turkey meanwhile also expressed their will to establish municipal structures in several declarations for “Democratic Autonomy”. The latest, carrying the title “Declaration of the Political Solution”, was issued in an extraordinary general assembly of the DTK, Democratic Society Congress, in Amed/Diyarbakir on December 27, 2015 – at a point of time when Turkish state aggression against Kurdish civilians had reached yet another peak. Based on principles of self-governance, multiculturalism and confederalism, the statement proposed the formation of democratic autonomous regions throughout the whole country, aiming to build federal and genuinely democratic structures in highly centralized Turkey – similar to the democratic transformations that took place in post-Franco Spain. It is no coincidence that the demands pushed forward in both parts of Kurdistan are almost identical, both demonstrating an attempt at formally installing a confederal municipal system into the region. Some say such similarities are due to the people’s geographical and cultural closeness. Yes, the artificial borders of colonial mapmaking did separate lovers, families, tribes, entire villages and cities after World War I. Yes, the designation of the Turkish-Syrian border along railroad tracks for instance has produced Syrian citizens of Ayn al-Arab on the one side and citizens of what the Turks called Suruc on the other side – despite the fact that both parts belong to the traditionally Kurdish town of Kobanê, in a way that is similar to the physical division of Berlin by a wall. Certainly there is truth to the Kurdish saying: “You can brew a tea in Suruc, and drink it in Kobanê”. So yes, there is a high degree of geographic and cultural interconnectedness, which also implies the existence of a Kurdish national consciousness. But more significant than a common national, geographic or cultural identity, however, has been a shared imagination of a genuinely democratic future for a society that can overcome the nation-state in a revolutionary act. This impulse has become the main driving force behind both declarations and the Kurdish movement’s political manifestation in the region – particularly in Syria and Turkey. What Hannah Arendt identified as the crucial component of the totalitarian problem, Giorgio Agamben made the root of modern violence: the necessity to belong to a nation-state. State power, as he defines it, has the ability to exclude and decide on the state of exception, hence to distinguish between “bare” and “sacred” life. In order to form a homogenous nation, the nation-state creates physical and imaginative spaces, where human beings can legally be deprived of their fundamental rights – just because they do not fit the norm. Put it differently: the nation-state can only maintain itself as such if certain groups, for instance LGBTQ individuals, women, ethnic and religious minorities or refugees, can be systematically marginalized by a state that only provides cultural hegemony for the majority society. “Bare life” does not only refer to the physical elimination of human life, but further implies all types of social and political oppression and exploitation by the nation-state. Homo Sacer, as Agamben calls the non-citizen or an individual that stands outside the nation, becomes a figure that can be sacrificed by state power. In a world where a paradigmatic nation-state centrism applies almost automatically – even for the Left – minorities are often offered three options only: either they assimilate into the majority society, become Homo Sacers of the system or supposedly free themselves in forming their own nationalist movement and building their own nation-state. In case of the latter, most of the nationalist movements do not even consciously realize – unless they have internalized critical self-reflection – that they replicate their oppressors most when they reconstruct a status-quo based on state loyalty and nationalism, that ideologically functions as a kind of ‘supreme religious worship’. A vicious cycle. The Kurdish movement under the leadership of Abdullah Öcalan, founder and ideological father of the Kurdistan Workers’ Party (PKK), started off as a Marxist-Leninist guerilla movement in Turkey that fought for a separate Kurdish state. However it has transformed itself into a postnational movement, abandoning the desire for statehood, and promoting new governance structures that transcend state-ness and nation-state borders. The Kurdish movement has embarked on the Kurdish experience of being the first Homo Sacers of the emerging nation-state system of the twentieth century to have internalized a dialectical relationship with state power. Throughout history, Kurds, like many other ethnic and religious groups, have always been subjected to cultural homogeneity enforced by state ideologies that were expressed solely in ethnic and racial terms, despite the multicultural, multiethnic and multireligious texture of the Middle East. The Kurdish movement has thus successfully broken through the vicious cycle in proposing an emancipatory model of multicultural governance that does not reproduce the state. Abdullah Öcalan, architect of the idea of Democratic Autonomy, which was later concretized in the model of Democratic Confederalism, has named three ills of our contemporary civilization, which he refers to as “capitalist modernity”: nation-states, capitalism and patriarchy. His theories therefore always have as their aim the formation of an antithesis to these three ills of our time, offering a political solution to the need to regenerate society politically and morally. Despite the harsh conditions of being in solitary confinement on Imrali prison island in Turkey since 1999, Öcalan has proven talented at elaborating the theories inspired by the lens of his own biography and the region’s ongoing traumatic experience of cultural homogenization and oppression by the state system. In order to re-create a morally and politically capable society, something “capitalist modernity” has destroyed, Öcalan articulates the need to build a system in which decisions are made collectively, where the members of society know about their past and determine their present and future. Bearing in mind the risks of direct democratic decision-making, he submits that only in a society where the values are based on ecology, democracy and women’s freedom, can it be ensured that collectively-taken decisions will be just. Intrinsic to the establishment of Democratic Autonomy, he therefore argues, is an ecological women’s revolution. Characteristic of “capitalist modernity” is the hegemony of the state, capitalist classes, and the men that have throughout time appropriated and deprived society, the poor and women. History however has shown, as Öcalan submits, that the dispossessed ones have always resisted and fought against these strings of “capitalist modernity”. Since resistance against the status quo has always been part of human history, it therefore has a place in our collective memory. Öcalan argues that this knowledge forms a natural self-defense mechanism. He calls it “democratic modernity”, introduced as a Gramscian counterhegemonic category. This means that even an already-created ecological and democratic society based on women’s freedom must continuously defend itself against the emergence of the centralized power of state-ness in the aftermath of its revolution. For Öcalan, this only becomes possible if “democratic modernity” is continuously formulated as an antithesis to “capitalist modernity”, by the society itself. The word “Democracy” is the key to Öcalan’s theory. He claims that all nation-states have been predestined to fail, since they have never opened up enough space for society to democratize truly. Democratic Confederalism however is essentially radical democratic in nature and aims for a new politics that is ethical in character and grassroots in organization. Radical democracy however should not be misread here as part of a state-centered concept of regional autonomy, which is all about “taking over” councils or constructing a more “women friendly” environment, as it is the case in Switzerland for instance. The idea of Democratic Confederalism, as well as of libertarian municipalism goes further than this. It is about achieving a new ethos of citizenship and community in transforming and democratizing city governments, by rooting them in popular assemblies in order to then weave them together into a confederation consisting not of nation-states but municipalities. Many times, Öcalan has insisted that the build-up of Democratic Confederalism would neither threaten the territorial integrity of nation-states nor disregard the sovereignty of the central government. However, the municipal structures would over time make those physical and imaginative borders of the nation-state irrelevant for the political realm of community life. Democratic Confederalism therefore is a model of dual power, in which a situation is created that makes it possible for self-administered, municipal areas to coexist next to the nation-state. The most striking practical manifestation of how Democratic Confederalism was self-formatively built in a revolutionary act, was seen in the iconic resistance of the male and female fighters of the YPG and YPJ forces in Rojava against Islamist groups such as Al-Nusra and the Islamic State. Although the Kurds’ demand for self-determination in the form of Democratic Confederalism, as put forward by Öcalan, was first brought to international attention by the distinctive Rojavan revolution, the original attempts at realizing the concept were already made back in 2005. As part of the paradigmatic transformation of the PKK, a new umbrella organization, the Group of Communities in Kurdistan (KCK) was founded in order to gather all different parties and groups together under one roof – according to the Democratic Confederal principles of equal representation and consensual decision-making processes. This was the first step toward the practical formation of plural, decentralized and confederal political bodies. Following this paradigmatic reconceptualization that turned away from building one’s own nation-state to the construction of a free society for all peoples of the entire region, the guerilla units of the PKK, which initially were only regarded as an armed threat to the nation-states, became aware of their great social impact on the region. Conflict resolution in the form of village assemblies initiated by the guerillas were introduced and replaced traditional feudal mediators. Women in particular started relying on all-women guerilla units that educated women in the concept of self-defense – not only practically and physically but more importantly, ideologically. Women started to organize themselves in collectives to defend themselves against violence, forced marriages or honor killings. Öcalan describes the need for self-defense not only on the basis of protection from physical violence by the oppressor but also in symbolic and cultural terms. Hence women’s self-defense can only be truly set into place when all social structures are transformed and men and women equally participate in all formations – be it in institutions, running the economy or leadership positions. The dual co-chair system that has been implemented at every organizational level with one position reserved for a male and one for a female is only a taste of the practical outcome of Öcalan’s ideals. The female chairperson is elected with the women’s vote only, unlike the male chairperson who can be elected by both men and women. Since the core principle of Democratic Confederalism and a free society is the liberation of the woman by women, all institutions provide a veto right to women on decisions affecting them. The aim is to build self-defense mechanisms institutionally as necessary in order to protect against the exploitation and corruption of men. Öcalan’s ecological, women’s rights and democratic discourse has always been perceived as a direct threat to the nation-state, by Turkey in particular. Hence the Turkish government has put a lot of energy into trying to sabotage any attempt at building Democratic Confederalism within and outside its borders, whether by deploying political persecution or the closure of the political parties that proposed Democratic Autonomy in their party programme, or the destructive force used by the Turkish state against youth organizations that have organized themselves in village assemblies in Lice, Yüksekova, Nusaybin, Cizre and Dersim to defend themselves against the state’s military attacks. Yet, Democratic Confederalism on the basis of municipal libertarianism lives, through carrying people beyond the limits established by the status quo. It finds its realization in a de facto organization of communal structures that come together in a confederation that overcomes given nation-state borders. A confederal Kurdistan seems to be the only logical consequence of a self-formative struggle out of conflict with the state. The only true limitation of Democratic Confederalism or of a “new politics” in the form of a “communue of communues” is therefore certainly the people’s own imagination.